Based on market research, the perception of the Chico's brand was that it was for "frumpy older women". The brand needed a makeover, so we decided to lead with an influencer-based approach featuring stylish, inspiring women within Chico's target of women 50-60. Women like Cindy Joseph who created the first "pro-age cosmetics line", Tara Averill, founder of networking site Splitsville that puts a positive spin on divorce – "it's over, you're not", and Beth Djali, style blogger at styleatacertainage.com. The content rich branding campaign was called "Hello I'm Fabulous", capturing the mindset of these confident, multi-faceted women. It included TV, print, social and a new editorial approach to Chico's catalog and website. The TV spot was meant to tease the campaign, as we follow a day in the life of a stylish woman that could be any age, never really seeing her face. Only at the end do we see that she's a gorgeous woman in her 50's who wears Chico's clothing flawlessly. We created content for the website and blog featuring influencers in interviews, videos and cross-promotions. It was a cost-effective, mutually beneficial relationship in which the women became ambassadors for the Chico's brand, and Chico's promoted the women's products or causes to a loyal customer base. Chico's customers engaged with the content and loved seeing these inspiring women as the new face of the brand. Win, win, win. Part catalog, part magazine – we helped transform Chico's mailers into a more engaging, content-rich publication. 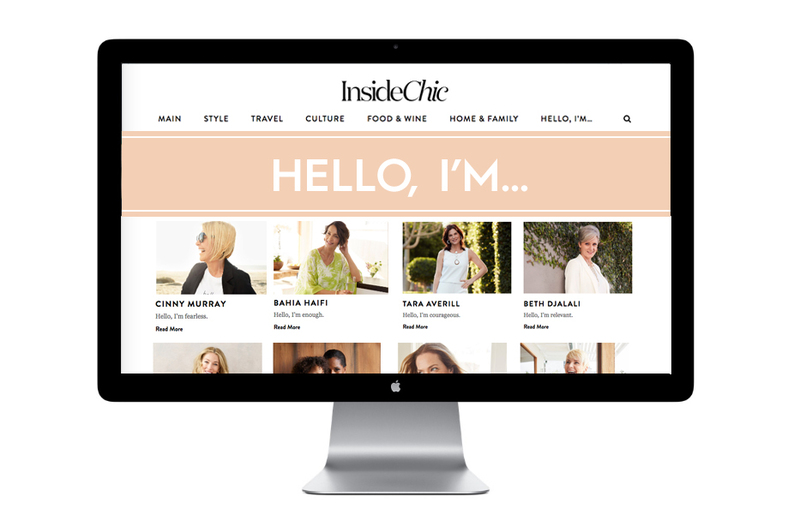 In social, we drove to online content, held contests and giveaways for Chico's clothing, and reposted images of loyal customers that engaged with the campaign.